Normally the first Inuit weave or its inverse is applied to Opening A or some other 3-loop configuration. But what would happen if you started with a 4- loop opening? 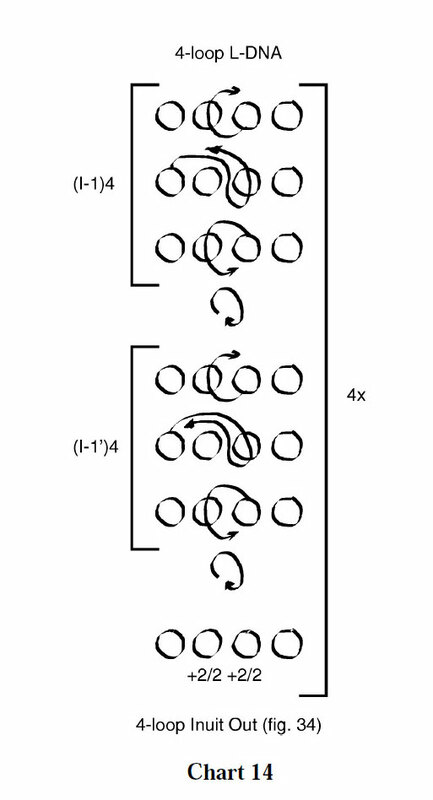 Using circle notation, it’s easy to envision a classic 3-loop weave transplanted into a 4-loop environment. To do this one simply adds an extra circle to the end of each row in the corresponding chart. When the charts for the first Inuit weave and its inverse are emended in this way, two new weaves emerge: (I-1)4 and (I-1′)4 (the “4” suggests a 4-loop environment). See charts 12 and 13. When these weaves are spliced into the chart for ‘Cherokee Seven Stars’, a beautiful new figure results (below, chart 14). The center star splits, and two internal transverse strings now pass through each of the eight stars. The extra circle can also be added to the beginning of each row. This shifts the action from the thumb, index, and middle finger loops to the index, middle, and little finger loops. Thus, two more weaves emerge: (ÆI-1)4 and (ÆI-1′)4. See charts 15 and 16. 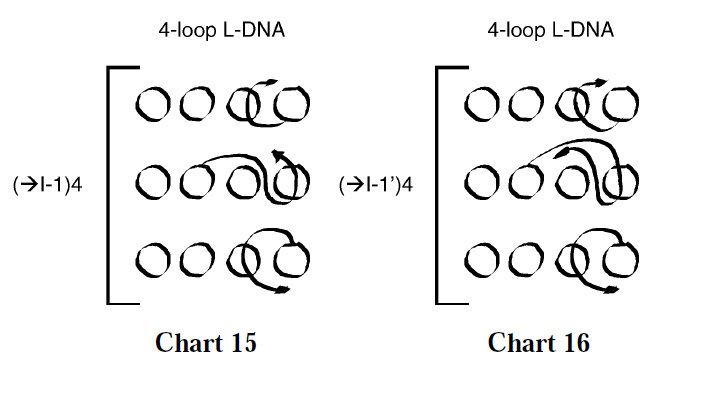 4-loop L-DNA loom, [(I-1)4, (ÆI-1)4, roll, (I-1′)4, (ÆI-1′)4, roll]3, rotate index loop +2/2, rotate middle finger loop +2/2, 4-loop Inuit Out, Power Lift or Caroline Extension (fig. 35). If the circle notation charts for the (I-1)4 and (I-1′)4 weaves are viewed in a mirror, two more weaves emerge: -(I-1)4 and -(I-1′)4 (see charts 17 and 18). Because of their mirror image relationship to the parent weaves, I call these “negative” weaves. 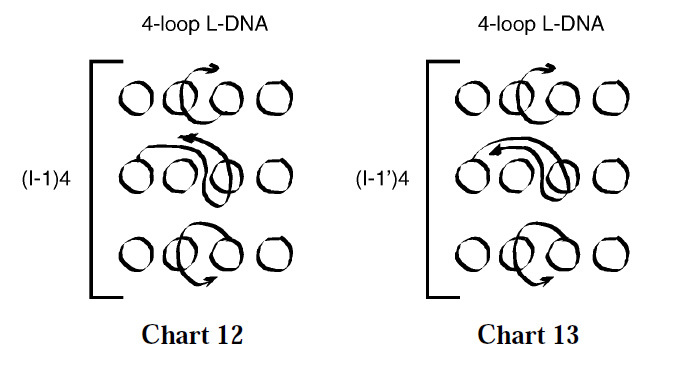 Variation 6: 4-loop L-DNA loom, [(I-1)4, roll, (I-1′)4, roll, -(I-1)4, roll, -(I-1′)4, roll, rotate index loop +2/2, rotate middle finger loop +2/2]2, 4-loop Inuit Out, Power Lift or Caroline Extension. 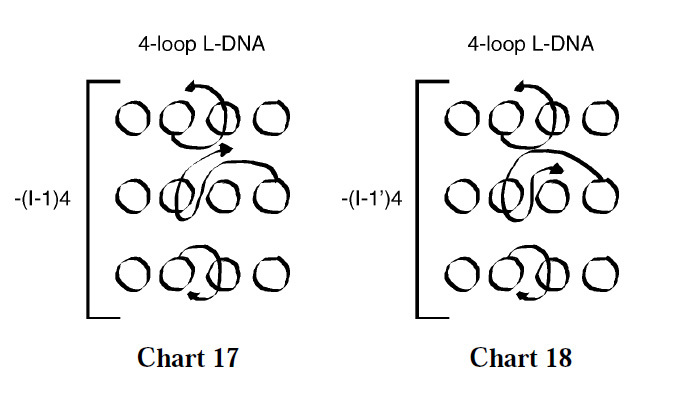 Variation 7: 4-loop L-DNA loom, [(I-1)4, roll, (I-1′)4, roll, rotate index loop +2/2, rotate middle finger loop +2/2, -(I-1)4, roll, -(I-1′)4, roll, rotate index loop +2/2, rotate middle finger loop +2/2]2, 4-loop Inuit Out, Power Lift or Caroline Extension. The differences between these figures are most striking when each is woven with a two-color octagonal loop. The two colors highlight differences in the way the innermost transverse strings duck in and out of the wraps that form the junctions between diamonds. A close-up of the junctions is shown below. Ducking occurs whenever the index and middle finger loops are rotated between pairs of weaves. If omitted, the transverse strings fail to duck through the wrap that separates diamonds. Weaves can be done twice before switching to a related weave (below, chart 19). These types of weaving sequences, when transplanted back into a 3-loop environment, are also quite interesting (below, chart 20). One can also experiment with skipping a rolling maneuver between pairs of iterations (below, chart 21).